Is love enough in dealing with matters of translation? I want to talk a bit about some issues with this, and while it may start out sounding esoteric, stay with me, I’ll end up as immediate as anything. I’ve presented Chinese poetry here before. Collected classical Chinese poetry goes back to around the 10th Century BC, materials gathered from an oral tradition around 700 BC and written down by Confucius or his school, and also a later golden age in the 8th Century AD for literary Chinese poetry. In Western terms, that’s from the time of the Bronze Age Trojan War to the time of Homer to the European Dark Ages. If you enjoy thinking about large amounts of time, consider those dates again, that’s 1,800 years between the time of the oldest Confucian Odes (or the Book of Songs as it is often called), and the time of Du Fu and Li Bai, and then over 1,200 years until now, a total of 3,000 years—enough time to get through that bookshelf of books I’ve put off reading to do this project. Or if you’re a listener and want to relate this to the oral culture of the Modern or the Bronze ages, in that 3,000 years span you could listen to every one of the 20 million tracks on Spotify 26 times each and still have time to go for a night walk in the country while trying and failing to count the stars. Let us contemplate the differences inherent in that much time. How different was the culture of Du Fu’s time or his anonymous predecessors who sang the Book of Songs before it was a book? I can’t even begin to compress those differences into a short post. We sometimes speak about unchanging “human nature” when talking about such a great divide of time and place—and yet, then we turn the page (or flip to a new browser tab) and read about how technology and social changes may have significantly altered how humanity works in a decade or two. How much differently did a poet or a listener/reader evaluate, create, and experience poems then, compared to now? Both of those conclusions could be true (essential, retained, human nature elements and change that is not slowing in velocity), each moving from opposite edges of the human experience in proportions hard to measure objectively from inside it. Into this gap steps the translator (and in our case here, also the performer) who seeks to render the written record of these poems from a place so far away in time that great geographical distances seem minor. The task of translating a hundred-year-old poem from French to English is difficult enough—but this? Should there be any surprise that many of these translations will seem inaccurate and differ significantly between themselves in their approximations, or that areas that would be understood by the poet or their more contemporary readers remain mysterious? Greater scholarship and cultural knowledge than mine may help in these approximate efforts at translation and performance, but even then, one should understand the difficulties and likelihood of success. And yet I do it. I want to try to grasp this, however imperfectly, not because I am Du Fu, or his nearest like extant, but because his story is different. I promised I’d eventually get immediate. Here’s the first level of the now: think of the occurrences in our times where a choice to use, perform, or even experience cultural expressions of our contemporaries will draw condemnation on the grounds of cultural appropriation, non-identical background tone-deafness, or of just plain laughable or painful ignorance on the part of the artist (that last often two sides of the same flaw). Some of these are very practical objections. In financial (as opposed to artistic realms) cultural appropriation impacts people’s livelihoods. Yet there’s no Du Fu or other 8th Century Chinese man to perform his work with a closer understanding today. And Du Fu himself, as a neo-Confucian, probably realized that his appropriation of Confucius’ literary appropriation of the oral tradition Book of Songs material would be different and inexact in his own way. Even if we’re necessarily failing, creating in our errors a cultural “telephone game,*” if we do this humbly and with respect for our forebearers, ancient or contemporary, I believe it’s honorable work. 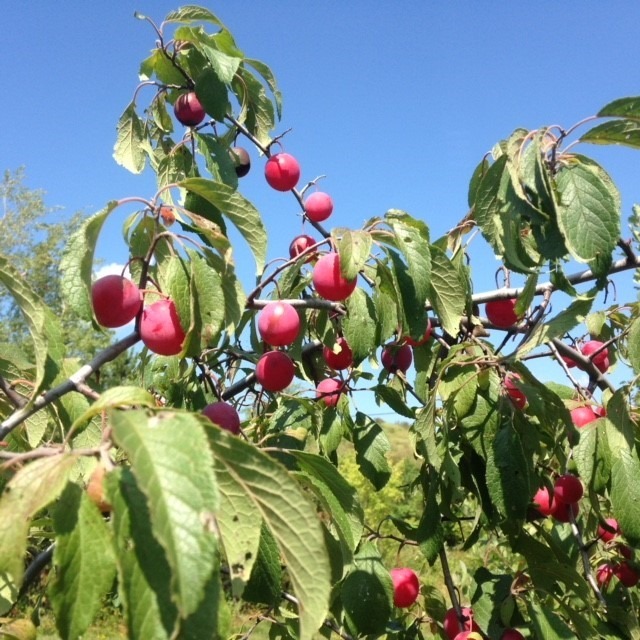 Here’s a second here and now: I mentioned I was re-reading some translations of the Confucian Odes because my wife sent me a copy of one of those poems in translation, the one I’ve reworked into today’s piece which I call “Wild Plums.” This was a gift of love I received in gratitude—even if the composer/performer-with-a-pedantic-streak part of me wanted to know who translated it, and if I could find a literal raw translation for another perspective on the work. ** And here I found this, which indicates that it was not intended originally in Chinese in the way the translation presents it in English. My guess is that the translator loved the word music they found in it, that repetition of the line “the plums are falling ,” and this lured them away from the original meaning. As best the literal translation I linked above can transfer an original meaning to me, the woman who speaks in it is either claiming that she has so many suitors that a successful one will need to up his game to make the cut (a Bronze Age “No Scrubs”) or it’s a portrayal of an eligible woman who is being too picky about a husband and has driven suitable mates off. So, the poem that my wife sent me is probably not accurately translated, and yet it expresses something that was engendered in the translator by it, and by the caroms of life that bounced off my wife and to me. And that poem’s yearning, and the music of it in English has its own beauty, like the love that brought it to me. And so that is what I adapted and performed. I’ve even added some additional refrains to further emphasize the musicality of the piece. To listen to the LYL Band’s musical version of this very old poem in it’s more romantic guise, use the player below. *Also called “Chinese whispers,” unintentionally helping me make my point. **That my wife is willing to tolerate this dreadful mix of traits is one of her charms, she even found and sent the less romantic literal translation as well. Next > Cold Is the North Wind, and Why Did Confucius Collect a Book of Songs Anyway? I loved this piece even before I got to the shout-out! I studied a lot of languages (including two Asian languages, Lao and Khmer) in the Foreign Service, and I spend a lot of time thinking about translation and its inevitable limitations. The “telephone game” is a great analogy. Reading this, I started thinking about WHY people choose to translate. The Modernists, especially Pound, turned to Japanese plays and poetry as part of their reaction against Victorianism, which is of course a different context from the original one but stemming from a similar urge to strip away non-essentials.